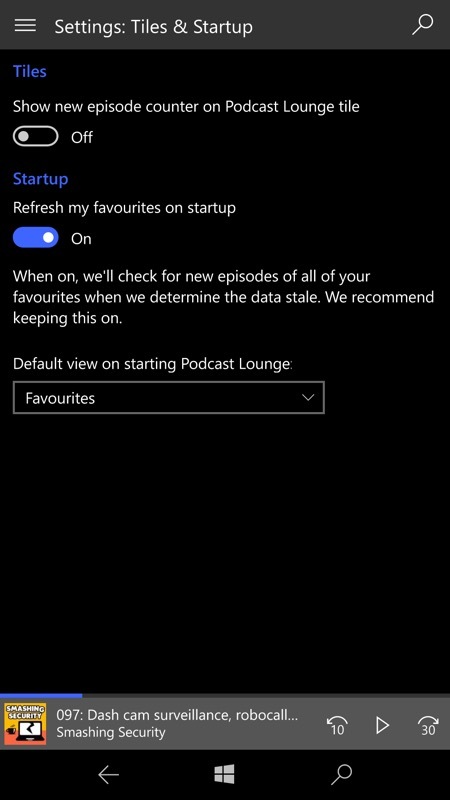 Last mentioned here in July, Podcast Lounge 2 has completed its latest huge round of beta testing (seriously, there's a lot of effort in each major update) and is now out as an update in the Microsoft Store. 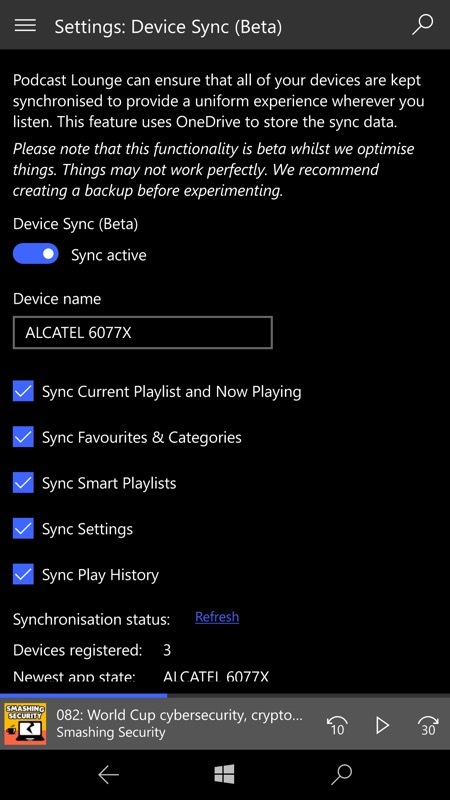 Go grab it, since it offers cross-device sync of favourites, play history, playlists and settings - oh, and Xbox compatibility for the first time. 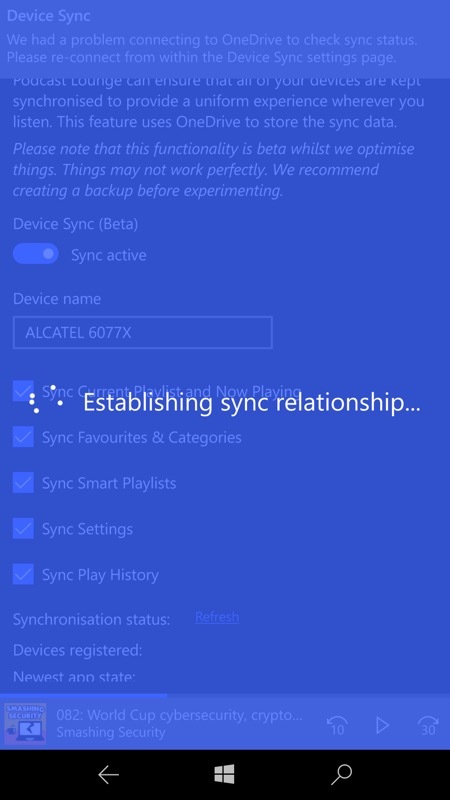 New: Cross-device app state synchronisation engine syncing favourites, play history, playlists and settings. This will remain in beta whilst we test with a larger population. There's a much fuller changelog here on Richard's site. 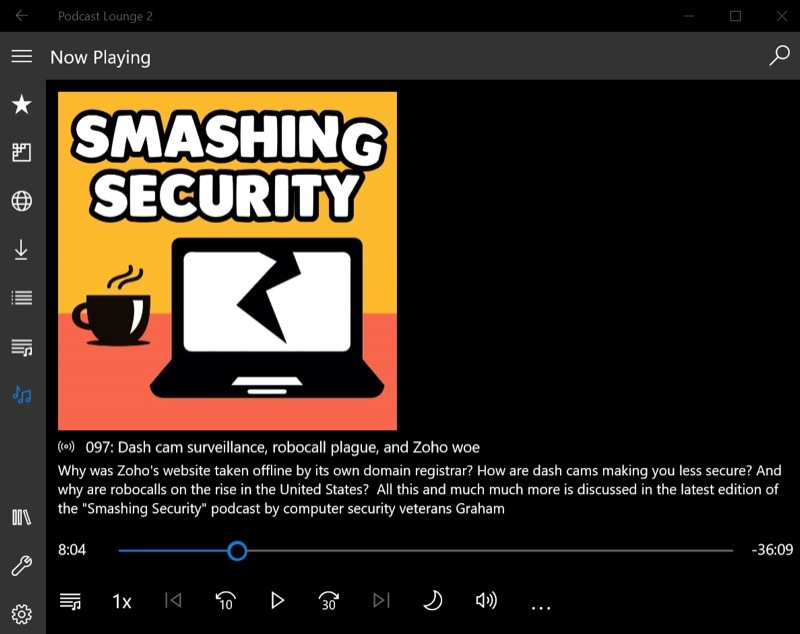 Here I can configure what gets synced (effectively everything about your current set up and progress) - there's a handy 'Refresh' control if you need to kick a sync off manually; (right) testing the sync system, here's my currently listening podcast, the excellent Smashing Security - note the playback position. 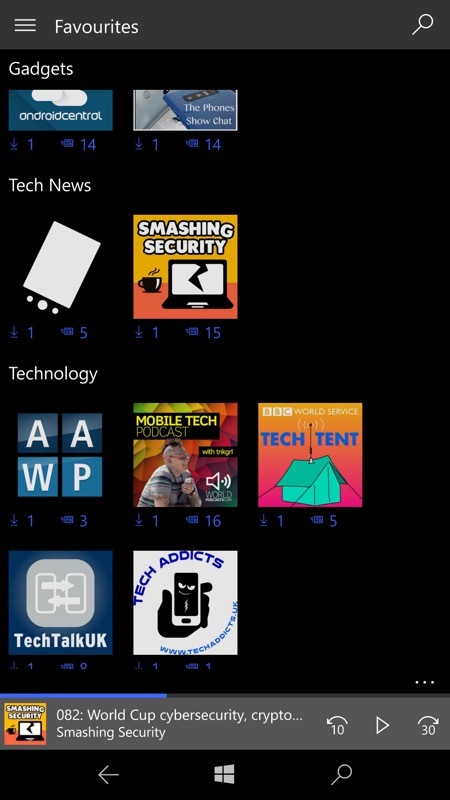 Now over on my Surface Pro, I boot up the new Podcast Lounge 2 and sign in with the same Microsoft account - hey presto, everything's as it is on the IDOL 4 Pro, including currently now playing podcast and playback position! 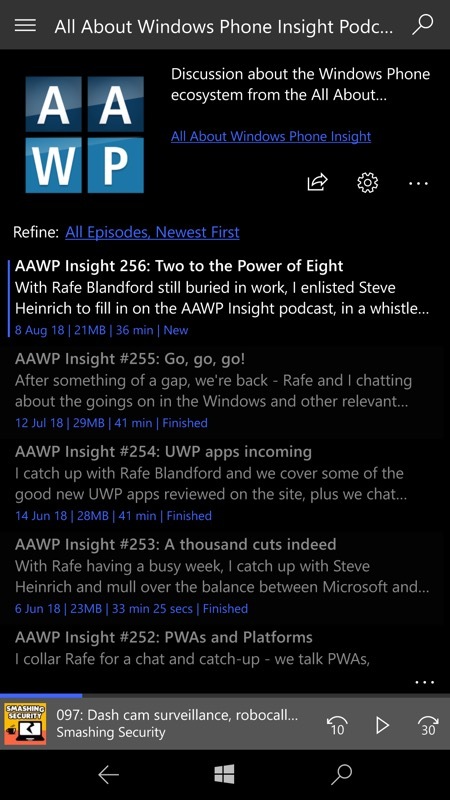 Other than the abortive Pocket Casts a few years ago (which promised frequent updates that utterly failed to happen), this is the first time in Windows phone history that we've had reliable cross-device podcatcher syncing - and which is why I'm highlighting it here. Podcast Lounge 2 is free to download from the Store as a trial, but background syncing and download functionality will stop after the 30 day free trial expires. Or just buy it outright as a commercial purchase (about £5), as I did. It will work on Windows 10 Mobile - and via Continuum displays - on traditional Windows 10 laptops, desktops and hybrids, and - now - on XBox too (in beta).